In America, when people think “police car” they usually have a Platonic image of a Ford Crown Victoria in their mind. In England, people feel the same way about the Vauxhall Astra. The Astra is a compact, competing with the Honda Cvic and Toyota Corolla. It’s actually built by Opel and rebadged as a Vauxhall for the British market (both companies are divisions of General Motors). It was actually sold here a few years ago as a Saturn. The Astra may not look very intimidating, but it does look pretty good. 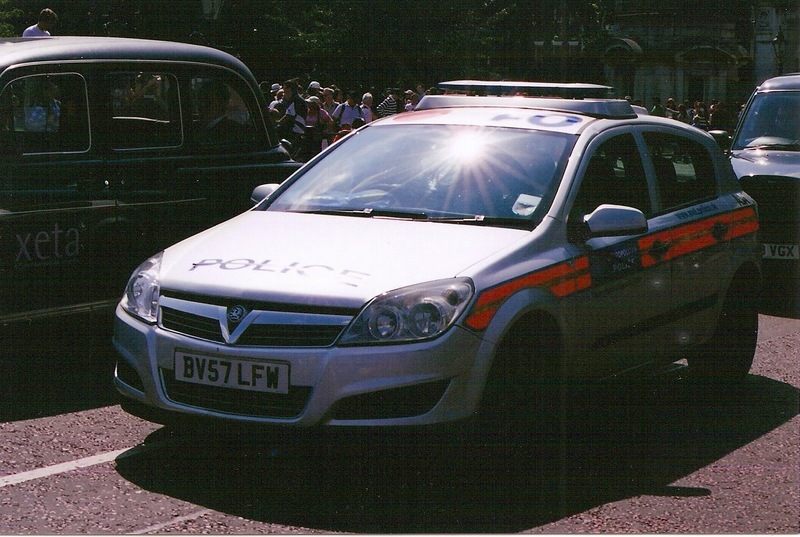 Econobox or not, it’s one of the best looking police cars around, a rare styling hit for GM in a mainstream segment. I still wish they had found a way to sell Astras under a different brand in the U.S. While the Crown Vic is a more badass car, a V-8 powered land yacht probably isn’t suitable for police work on the tight streets of London. They are much narrower than the ones in American cities; a bigger car might have trouble weaving between black cabs and wheezing Ford Transit vans in a pursuit. In many respects, England isn’t that different from the United States; in London, they print McDonald’s coupons on the back of bus tickets. But the automotive landscapes in the two countries are still worlds apart. You’ll never see an American cop driving an Astra, or a Bobby driving a Crown Vic.